With the explosion of technology and accessibility the importance of digital safety is clear for all… however what are the skills kids need to prepare them for the exciting world ahead and when should we start introducing them? Traditional online safety has focused on high schools, however as parents of even nursery age children will say (myself included) their kids can be proficient in using iPads. That’s why we believe in giving kids the skills before they engage with the technology is a far more effective way of delivering real sustainable change and impact. The key to engaging children in online safety is to trust them. So what are three essential digital safety skills children need to develop to prepare them for life? 3. Develop digital self awareness - From digital footprints, to use of capitals and profile photos, an appreciation of your digital persona is essential for understanding how the world interprets you and your actions. As adults we have grown up with social networks and the internet, however we expect children to be fully competent in these areas, without giving them the opportunity to experience them in a safe way. 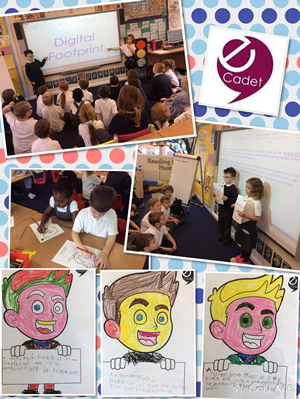 Teams of eCadets in primary schools across the UK have an inspiring impact in embedding key online safety learning because they lead on the subject across their whole school community. They do this through being a focal point for other pupils to chat with about all aspects of online life, as well as delivering class inputs on a wide range of curriculum-linked areas. So should children just experience online safety through IT classes? No there's great examples of coordinators in arts and craft empowering the children to make their own robots to illustrate computers we use. In early years the learning can come through colouring competitions to learn what computers are through to digital footprints. Pupils can even create audio clips to explain what a digital footprint is - here is one created by a Mini eCadet. As digital safety grows and evolves it’s important schools have three pieces to the jigsaw in place to ensure they are getting the maximum impact – training for teachers, technical resilience (filters) and empowering the pupils. Together these three components provide a safe nurturing environment to help the future generations of digital pioneers get the most from the learning opportunities to prepare them for life. We would like to thank our new partner and guest blogger, Henry Platten from eCadets, for his thoughts on this topic. To find out more about Henry and eCadets, click here. 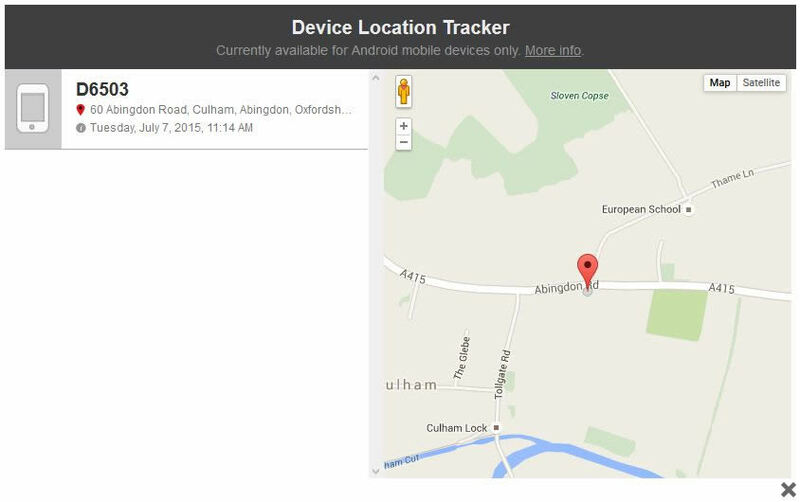 Using monitoring software to help keep children e-safe. Some commentators suggest that monitoring software is a bad thing, used only to spy on young people, intruding into their privacy, and that all we really need to do to keep them safe is talk to them about the dangers they face in the online world. At Point2Protect, we disagree. We believe that technology can play an important part in any e-safety strategy, providing vital intelligence and understanding which can then lead to better informed engagement. So, what can technology show you and how can it be used to help keep children and young people safer? Let’s take a tour of the Qustodio technology we use at Point2Protect, as an example of the type of monitoring and moderation you could be using. The Qustodio technology works at a device level, which means that you need to install it on each device you want to monitor, whether it’s a laptop, a tablet or a smartphone. Once you’ve done this, you register each device to your Qustodio account and then specific data is sent to your secure online dashboard, wherever that device is used. When you sign in to the Qustodio dashboard, you’ll arrive at a page that provides a quick summary of how the devices registered to this profile have been used recently. A profile contains a set of rules you want applied to the devices registered to it. So a school might have a profile for all Year 7 devices, while a parent might have a different profile for each of their children. This enables the rule set to be appropriate to the age of the children being monitored. 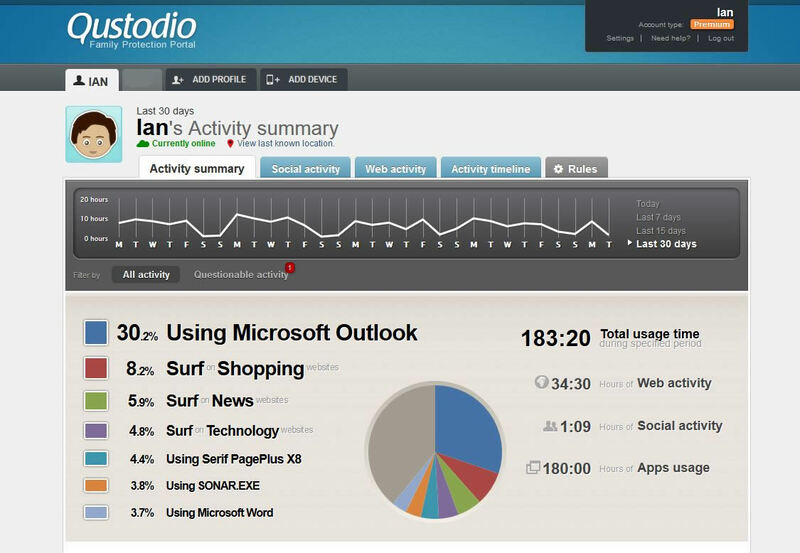 The example page here is showing activity from a Windows laptop, an iPad and an Android smartphone over a 30 day period. You can see that it reports on categories of use, such as surfing news web sites, as well as specific applications such as Microsoft Outlook. Scrolling further down this first summary page shows a word cloud and then three columns. 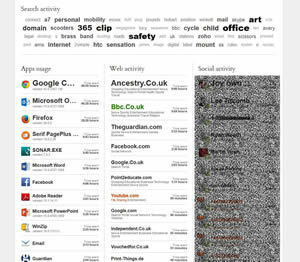 The word cloud is really useful, as it shows the search terms used on all the monitored devices over the last 30 days. This provides a simple and immediate insight into areas of interest and will quickly highlight anything that might need to be followed up. 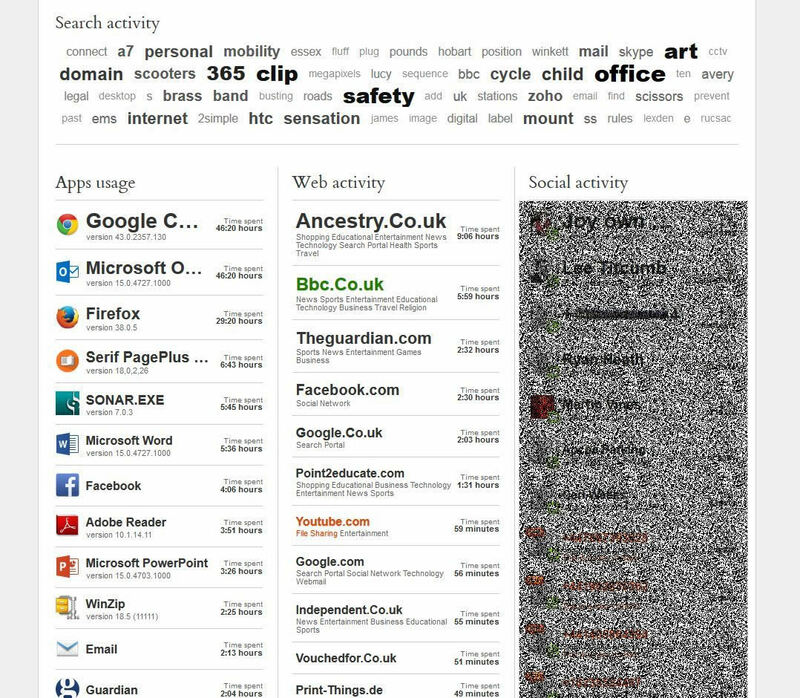 Below the word cloud, the three columns show the most popular apps being used, the web sites being frequently visited and the top contacts (I’ve hidden the third column detail deliberately). By clicking on any content in these columns you can immediately apply a filter. So, for example, if you decide that Facebook isn’t appropriate for the eight year old children using these devices, you can instantly block it in both the app and web site columns. This rule will then apply across all the devices registered to this profile. The third column shows contact to a smartphone from calls, text messages, Twitter and Facebook. We don’t delve any further into these contacts by, for example, reading their text messages or recording calls, as we feel this would be too intrusive. So it’s possible to see who children are in regular contact with and so judge whether these contacts are appropriate, but the content of these conversations remains private. Beyond the summary level, for each of the main activity areas (app usage, web browsing, social activity, etc.) 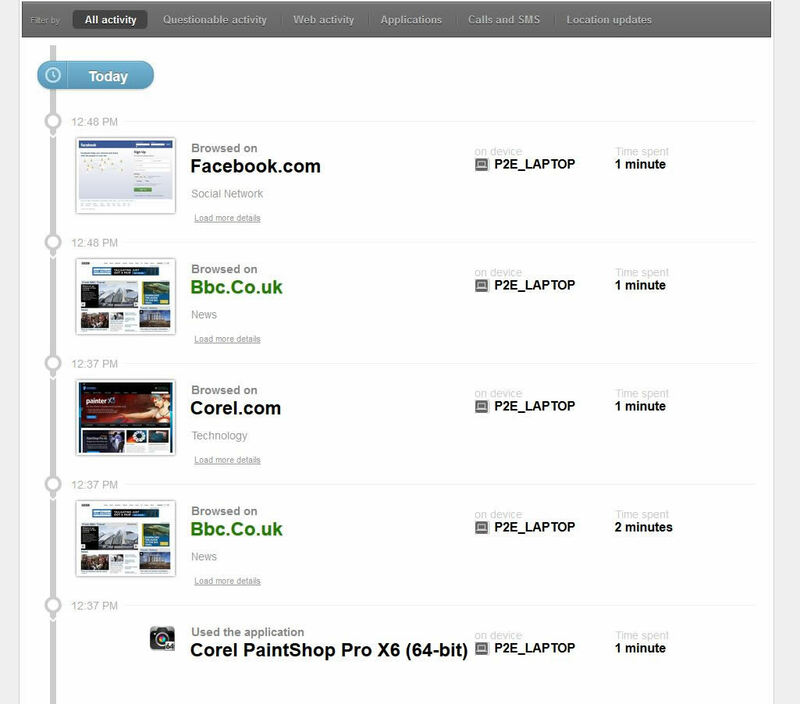 there’s a more detailed view of all usage – for example, the timeline of all web activity shown here. 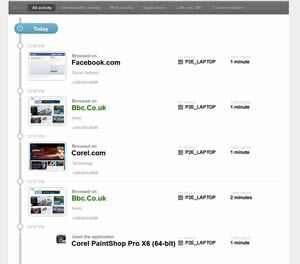 This enables you to see minute-by-minute detail on web sites being visited or YouTube videos being viewed. Another feature that’s particularly popular with parents is geolocation, which can pop up a Google map showing where a smartphone is at any time. This is also helpful for schools to keep tabs on any mobile devices like tablets that the students may use on a 1-2-1 basis. In an ideal world, schools will be working closely with parents to ensure that children are being protected wherever they are and not just when on the school premises. One Qustodio feature that immediately appeals to parents is the smartphone Panic Button. When pressed, this sends a text or email message to the key account contact informing them that the child feels unsafe and then showing details of their current location. 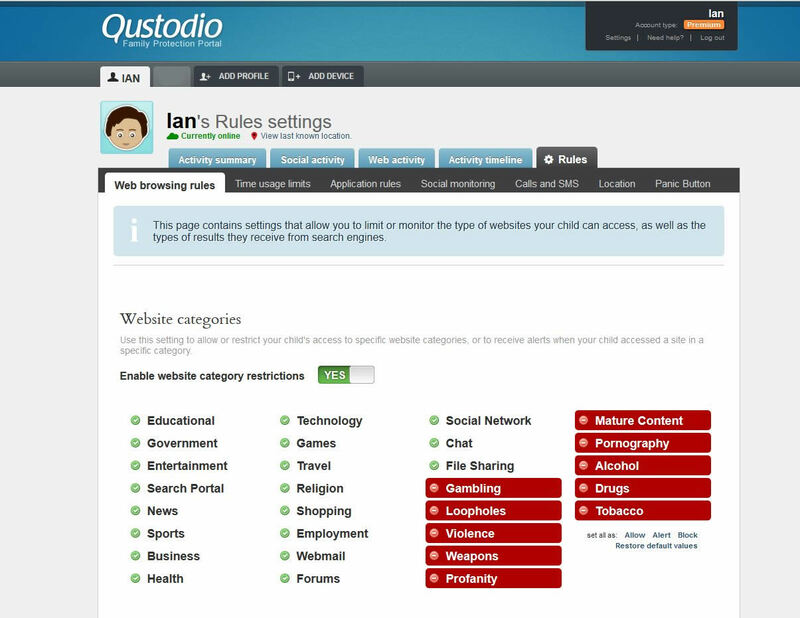 All the filtering and moderation functions of Qustodio are controlled from the single Rules tab. Here you can manage web sites by category, or select specific web sites to allow or stop. You can also allow or disable specific apps, or set up time limits for each day’s use of certain apps. All the controls in Qustodio, and we’ve only seen a few of these here, are designed to be easy to use for the non-technical. You can even create a schedule for all the devices registered to this profile in the account. So, for example, you could stop all devices from working after 10pm on a school night, or from working outside school hours. 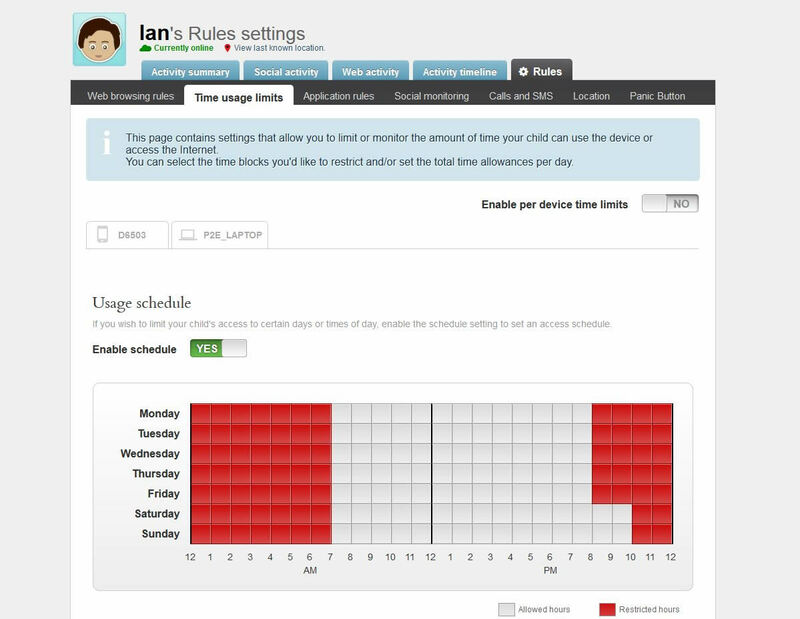 Once you’ve established the rule set for a profile, you can check-in to the dashboard when you wish, or set Qustodio to email a weekly report to you, or to parents. Clearly Qustodio is a very powerful tool to provide both schools and parents with a clearer understanding of how the children and young people in their care are experiencing the online world. The understanding of it enables better, more targeted conversations to take place, as well as highlighting areas where extra support or teaching may be necessary. We would emphasise that technology like Qustodio should be seen as a piece in the jigsaw of effective e-safety and not a solution in itself. At Point2Protect we believe that it’s absolutely critical to follow up understanding with engagement and education, and we provide content and resources to support that approach, including the excellent E-Safety Support service on this web site. However, one thing is certain. If monitoring technology such as Qustodio is being used as part of an effective, wide-ranging, community-wide e-safety strategy, we will all be less likely to hear either schools or parents saying, in the wake of a serious incident, that they had no way of knowing what the children and young people in their care had been doing online in recent months. That surely has to be a good thing. We are delighted to announce that Point2Protect will be offering a prize as part of the E-safety Support, Safer Internet Day Competition. Each of the UK category winners will receive a 100 device licence for their school for a year. Click here for competition details. After a successful 2 year programme of delivering vital e-safety information across the UK, the South West Grid for Learning are now planning a further series of 80 events to run until march 2016. Online safety is one of those areas of safeguarding that never seems desperately important until things go wrong; only then do a host of authorities appear to point out the massive gaps that have been missed. The recent Serious Case Review at a North Somerset First School where a member of staff had been systematically abusing children over a period of time clearly identified the glaring gaps in online safeguarding that in hindsight are so obvious but at the time, obviously didn’t register as a cause for concern. The E-safety Live Briefings are short sharp sessions that aim to provide the most amount of information in the shortest possible time at a local location to you...and they are free? In the broadest sense the sessions are designed for any professional working with children and young people, and certainly not just designated ICT leads in schools. There will be lots in the session for those in Senior Management, those who are accountable for governance, need to steer holistic approaches and formulate strategy as well as practitioners who are keen to extend knowledge and increase effectiveness. Anyone in the Children’s Workforce will benefit from the insight and the testimonials reflect the wide appeal. There will be content about current technology, latest trends and issues that are emerging, focus on some of the key research that is being carried out and the important findings from it. Guidance on policy and legislative frameworks as well as exploration of tools, techniques and strategies being employed to good effect. There is also signposting to useful sources of support. The scanning and scrutiny of material in the rapidly changing field of online safety is constant and the briefings are a vital component in efforts to ensure practitioners and policy makers alike are aware and conversant. The resource base, accessible by every delegate who attends through a password issued to them, reinforces all the headline content of the briefing by giving access to the detailed research, documentation, presentations, legislation and quoted material of any other form from the session itself. This includes media coverage, video clips, hyperlinks and multi-media interactions. The UK Safer Internet Centre are looking for organisations who would like to host one of these briefings, and are committed to achieve a broad reach. So urban or rural, North, South East or West, you could put yourself at the centre of learning and change.